OAKLAND, Calif.--(BUSINESS WIRE)--Students cheat for any variety of reasons, but, in many cases, sheer desperation and fear of failing drives them to hire someone else to write their essay, do their homework, or take their exam. Researchers estimate that 8 percent of students engage third-party individuals or services to complete their work, which is a practice called “contract cheating”. 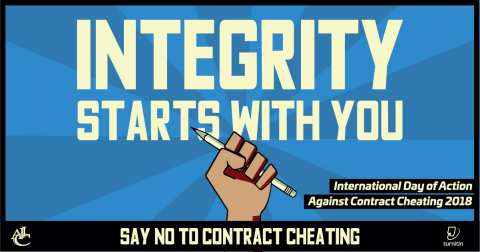 On October 17, colleges and universities will draw attention to this problem as instructors, students, and administrators pledge to #DefeatTheCheat and #ExcelWithIntegrity during the 3rd Annual International Day of Action Against Contract Cheating. Click to Tweet. For the media - Read commentaries from Bill Loller of Turnitin in EdScoop and MDR Education. Additional assets, ICAI’s press release about this event, sources, and background data available here. Executives and academics are available for interviews and commentary.